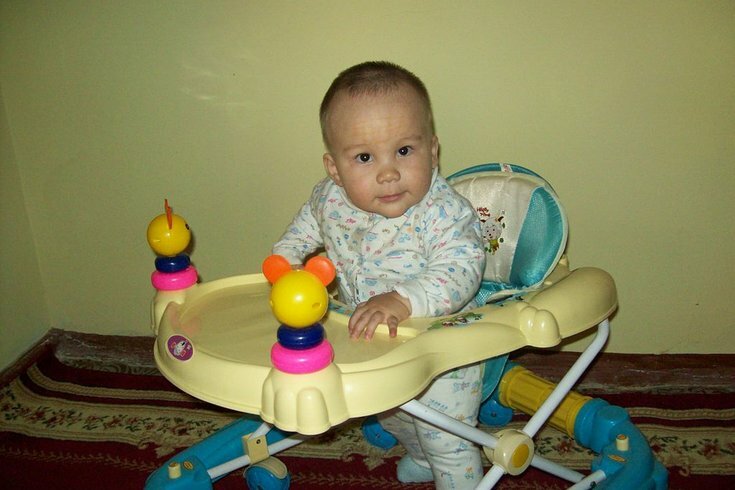 An infant sits in a baby walker. Injuries caused by infant walkers have decreased significantly since a federal mandatory safety standard was adopted eight years ago. But the American Academy of Pediatrics still wants them banned. A total of 230,676 children younger than 15 months were treated in United States emergency departments for injuries related to infant walkers between 1990 and 2014, according to a study published Monday in the journal "Pediatrics." Annual totals declined during that 25-year stretch, a decrease partly attributed to increased public awareness. More than 90 percent of the injured children sustained head or neck injuries. Nearly 75 percent were injured by falling down the stairs while in an infant walker. About 4.5 percent of the injured children required a hospital stay – and 37.8 percent of those admitted had a skull fracture. On Monday, the American Academy of Pediatrics renewed its call to ban the manufacture and sale of infant walkers within the United States, noting that more than 2,000 children suffered injuries in 2014. The walkers currently are prohibited in Canada. Between 1990 and 2003, infant walker injuries dropped 84.5 percent after a voluntary safety standard was adopted and stationary activity centers became more common. In 2010, a federal safety standard was adopted. Injuries then declined by 22.7 percent over the next four years – as compared to the four preceding years.